my rippley blanket is complete and i am most happy indeed. despite the fretting of colours, i do believe it turned out 'a-okay'. i know i am happy with it, because i have feelings of not wishing it to be shared with my clan members. this is a sign of me liking it very mucho. here is a few things you may wish to know if you are interested in what i did. if you are not, then you are welcome to skippity skip this bit. i do not mind one little bit. * i have discovered that when i add a healthy dose of cream to my crocheting it always appears to pull it together. i don't have one, i did but its fallen into a black hole in my brain, due to anxiety coming on through fretting about the safety of my blanket. i'm sure it was super thrilling and really interesting, but once again, alas and alack, we will never know. You crack me up. (As my 2-year-old would say, "that cracks me up--not break me, cracks me up.") I love to read your posts. That is just so much wishful thinking, Tif, you know very well the ripply goodness will prove much too tempting to every passing creature, large or small. The tray will have just sloped off for some quiet time, it is not lost. Have a spiffingly good weekend. Oh I hope you find little monkey tray soon, so he does not get lonely. In our house we light a candle for St Anthony, and anything that is lost and wants to be found will be. Try it and let me know how you get on! so lovely. I love your sense of color...you make me want to knit. I looooove the ripple! I am making one too, and it's funny how beloved these things become the more time you spend working on them. So funny. . . my son just asked me why I am always losing things. I paid him ten dollars to find my laptop. . . which was sitting next to my sewing machine. . . so I could read your blog. Nothing is ever really lost, it's just on vacation. . . like my brain. I know what you mean, about the memory thing, and the mislaid special items thing, and doing it ten minutes ago thing. Oh, so well. I currently would like to find the pile of stamps I stocked up on a couple weeks ago. As for the lovely afghan, perhaps you can suggest to others who wish to share it that they may do so, but they must wash their hands first, to keep the lovely picots clean and white. That may be just a little too much effort for most to bear. How you explain that to a dog, I don't know. A cat, well, small amounts of cat fur do tend to be a peachy finishing touch. Your blanket is looking very peachy indeed. Maybe you should hide it away. The special place you find for the blanket might be just where the monkey tray is. Your blanket looks tres sunny dear Tif. I do so like those colours. I am crappity crap at colour choosing..I have no imagination or style! have a fantastic weekend my dear. Do enjoy your class, it will be fabulous! 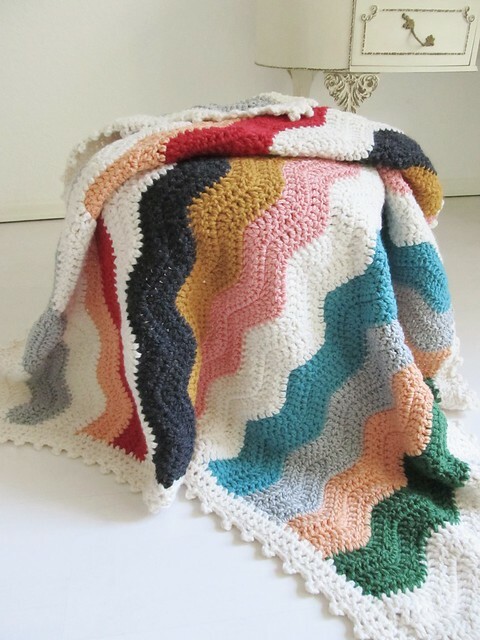 I love this blankie just for you and have been inspired to properly learn how to crochet. Having grown up on Vancouver Island, I understand the November gloomies and I am not sure which is more difficult: the West coast gloomies or the Eastern cold! I guess the only solution is to find warmth and colour inside our homes. Have a very wonderful and warm weekend! Hugs and love to you! 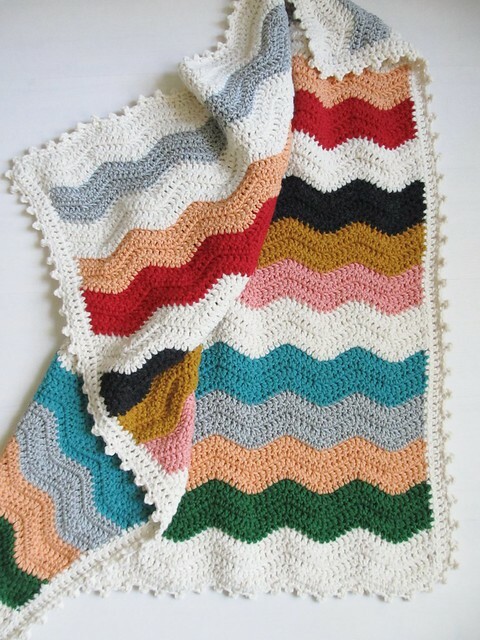 many thanks my dears, peachy weekends all round..
hehe, I just read this and I thought you might like my blog from last week on a a similar beloved blankie. 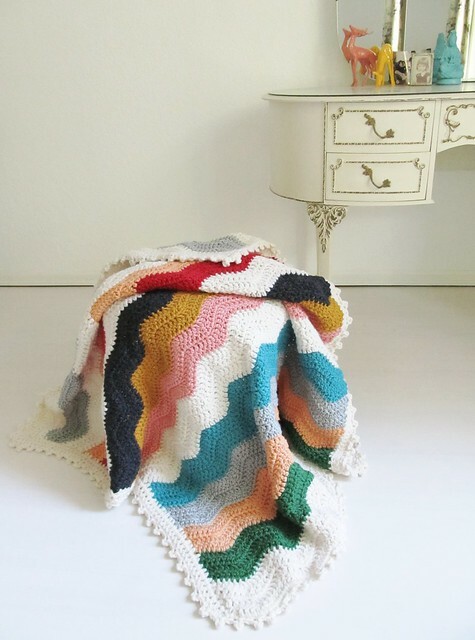 love the blanket and the colours! My recall skills are, indeed, absolutely terrible!